Soil microorganisms with phytase- and 1-aminocyclopropane-1-carboxylate (ACC) deaminase activities are widely studied as plant growth-promoting rhizobacteria (PGPR). Here, we explored the bacterial community structure and occurrence of putative PGPR in plants grown in agro-ecosystems and undisturbed ecosystems from northern, central, and southern Chile. Total rhizobacterial community structure was evaluated by denaturing gradient gel electrophoresis, and dominant bands present in diverse ecosystems were sequenced. Significant differences in total bacterial communities were shown with some bacterial orders (Enterobacteriales, Actinomycetales, and Rhizobiales) being highly similar to both ecosystems. Twenty-nine putative PGPR, showing phytate- and ACC-degrading activities and production of auxin, were selected from across the sites. Based on 16S rRNA gene sequencing, the putative PGPR were characterized as Enterobacteriales (Enterobacter, Serratia, Pantoea, Rahnella, Leclercia), Pseudomonas, and Bacillus, consistent with previously reported PGPR and endophytic bacteria. Beta-propeller phytase genes with similarity to Bacillus were also identified. PGPR from agro-ecosystems appeared to show higher auxin production compared to those from undisturbed ecosystems. This study demonstrates that putative PGPR are widely distributed across Chilean soils. 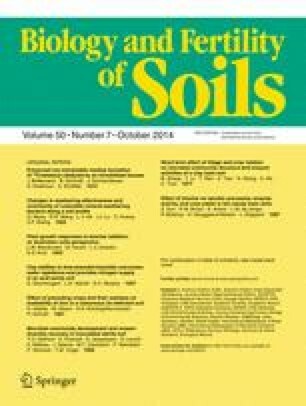 Further understanding of their contribution to the growth and adaptation of plant hosts to local soil conditions may provide opportunity for development of new PGPR in Chilean agriculture. Chilean Government financed this study through project Fondecyt No. 1120505 and 1141247. The authors would like thank to Dr. Howard Langer and M.Sc. Loreto Manosalva for valuable logistical support during sampling of Conguillio National Park and Patagonia, respectively.